The Duchess of Bedford was born in Hants in 1865, and educated at Cheltenham Ladies’ College. 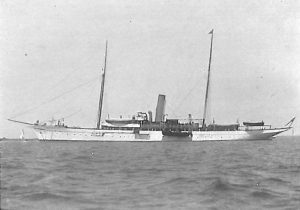 In 1897 she chartered the yacht Roxana, and has since chartered the Catania and the Sapphire, afterwards purchasing the Sapphire from Mr. Barbour. Although the Duke of Bedford is a member of the Royal Yacht Squadron and of the Royal Western of England, the Sapphire is almost exclusively used by the Duchess, and as she spends most of her time pursuing her hobby of ornithology, the Sapphire is generally to be found in Northern seas, and has visited the Orkney and Shetland Isles, the West Coast of Scotland, the Outer Hebrides, Norway and Spitsbergen, etc. Residence: 15, Belgrave Square, W.